Click on the image above to enlarge. I took a screenshot from my account at Ancestry.com, since it seemed the easiest way to render the tree with all the birth and death dates. I modified the image with a few notes, since some of the information is incomplete, plus it seems a little morbid to fill in details on those of you who are living. Hi, Just to let you know. My grandfather( Walter Morgan ) married Margaret Macgregor ( around 1953-1954) at our home in Huntington. My great great grandfather was William Headen . Harriet Headen Osterheld was ( my great grandmother. I think we may be related through Margaret Moore (married to William Headen) ? Nice to meet you. Hi Kit, good to hear from you! I’ve been in touch with folks on your side this past week (maybe your brother or cousin?). I’m delighted to hear about the cousin connection! Margaret Moore was the sister of my third great-grandmother Mary Ann Moore. Feel free to email me if you want to compare notes. 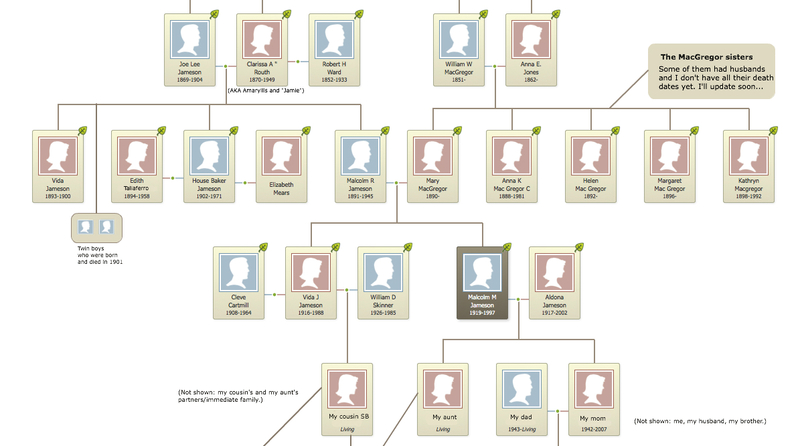 And I’ve been finding out some fun stuff about the Moores and Margaret and Mary Ann’s sister Hannah, so stay tuned!